Scientists just made what could be the rarest and most valuable material on the planet. As reported back in September, two studies, each with a different approach, were attempting to created metallic hydrogen, and now, more than 80 years after it was predicted to be possible, the Harvard University team has finally managed to produce the elusive state. Physicists Isaac Silvera, who has been working on this problem for 45 years, and Ranga Dias published their study’s results this week in the journal Science. To develop metallic hydrogen, Silvera’s team squeezed two opposing heavy-duty diamonds together to compress gaseous hydrogen, and then they transitioned it into its liquid state by lowering the temperature [hydrogen liquifies at a temperature of -252°C (-423°F)]. They then gradually increased the applied pressure on the solid hydrogen by twisting a steel screw to exert force on the diamond anvil. It was then that changes were noticed. This, of course, is no small feat. Transforming hydrogen gas into a metallic state, a phenomenon known as the Wigner-Huntington transition, was first predicted in 1935. Previous tests to bring this phenomenon to life had not been successful because diamonds would break under such extreme pressure, either due to flaws in the diamonds or the hydrogen itself diffusing into the crystalline lattice of the diamonds, causing them to break apart. To work around these problems, Silvera’s team used a reactive ion etching technique to remove any nanoscale imperfections and created a diffusion barrier by coating the diamonds with a thin layer of alumina. Hydrogen, element number one on the periodic table, is the most basic atom, just one proton with one electron. However, it supposedly possesses incredible potential in its metallic form. For one thing, physicists predict that metallic hydrogen is an authentic superconductor. 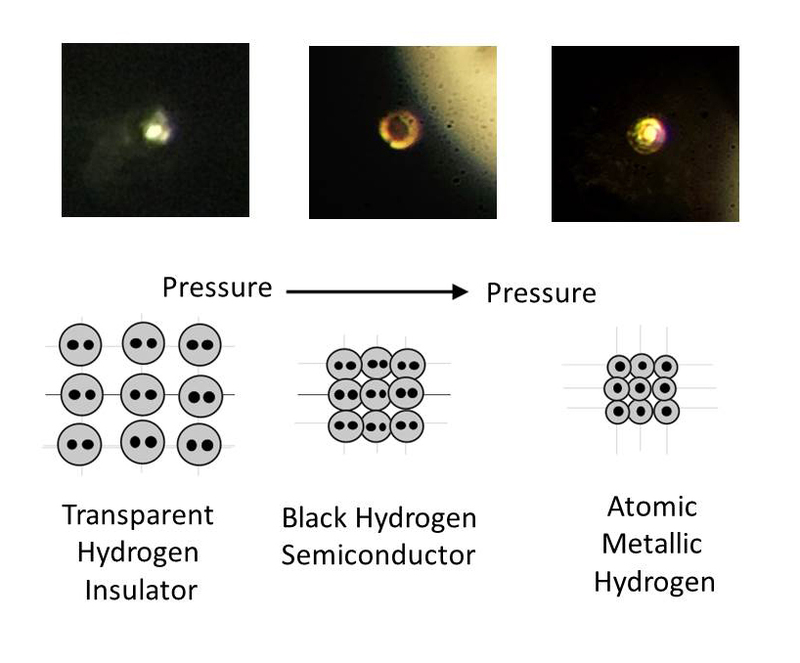 This gives metallic hydrogen a myriad of potential applications. “Let’s say you could make wires out of superconducting metallic hydrogen,” Silvera speculated. “Then if you transport energy, you would have no dissipation because it doesn’t have resistance. Right now, in our electrical grid we lose energy just by heating up the wire during transmission.” Dias also believes it could lead to the creation of superconducting magnetic storage, which “maintains persistent currents in superconducting coils.” This could be a useful tool for maintaining equilibrium in the power grid when using renewable sources like solar and wind, which produce electricity intermittently. Because it is expected to work both at room temperatures or higher, metallic hydrogen could replace the magnets currently used in MRI machines as well. Another application, which Dias calls the “most romantic,” would be “magnetic levitation of high-speed trains, based on the perfect diamagnetism of superconductors.” This could revolutionize transportation, as magnetic levitation is used for high-speed systems like the Hyperloop. Then there’s rocketry. A metallic state could make hydrogen “the most powerful rocket propellant known to man,” Silvera explained, about four times as powerful as existing rocket propellants that use molecular hydrogen and liquid oxygen. When heated, metallic hydrogen changes back to molecular hydrogen, which could produce a great deal of efficiently packed energy. “It would revolutionize rocketry,” he explained, “enabling you to explore the outer planets, to put rockets into orbit with a single stage, and lift large payloads.” This is no doubt why NASA partly funded the team’s research. While this is all exciting and potentially technology-changing, the only metallic hydrogen on Earth today remains in Silvera’s lab, in the diamond anvil under high pressure. The team has yet to see if metallic hydrogen could remain stable once that pressure is released, so for now, let’s just celebrate the discovery and remain hopeful for the day that metallic hydrogen changes the world.